Well, seeing as this post is going to be, in part, about more birthdays and nice authors who write nice things in your copies of their books, I think I’ll start here. By wishing my sister a Very Happy Birthday. I received the copy of Something Beginning With (fab book – read it!) 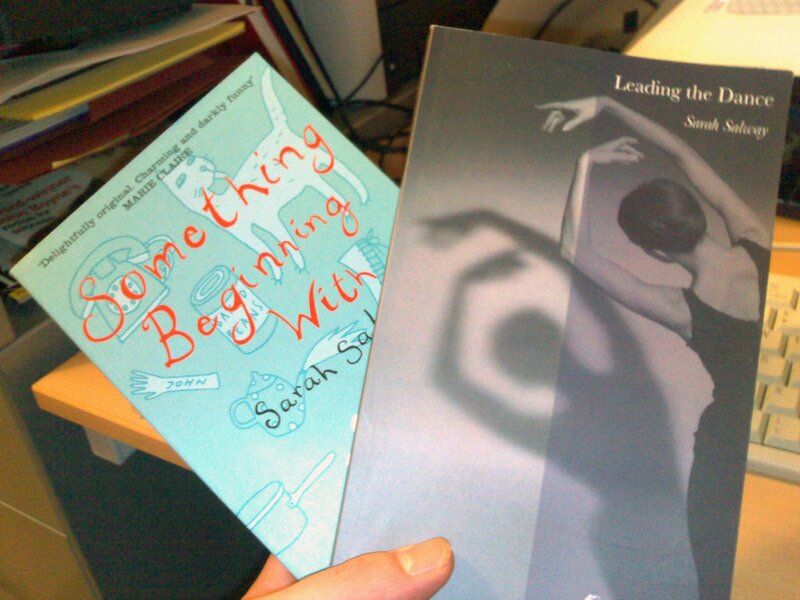 I sent to be signed by its author this morning – along with, as an extra – Leading the Dance – a collection of her short stories. Which is all rather lovely. Very much looking forward to reading it; if it’s as well written and entertaining as SBW then I’m definitely in for a treat. I’ve feeling it (and I) will be. I was also really chuffed to hear that she’d given the spare copy of my book I’d sent to her to some children who live near to her. I really hope they enjoy it. Thanks again, Sarah. This evening I handed out awards (medals actually) to about eighty children who’d completed the Summer Reading Challenge I mentioned a couple of days ago. And it all went swimmingly. I think a particularly big thanks should go to Alison and the library staff who did a terrific job of organising things and a great big well done to all the children. I was also very impressed with the photographer who came along for the local paper. Again, the organising of children and of me was done very well. After we’d finished giving out the awards and whatnot (not the item of furniture!) I hung around and chatted with some parents, some children and some library staff and signed some books. And it was all very nice. It turned out that one of the boys is currently being taught history by the same teacher who taught it me when I was ten. I was very lucky in that every history teacher I had was great, but it was nice to send him a message (via the pupil) to thank him for getting me interested in history. And last but by no means least (and I mean that! ), I’m very happy to be able to say that Prince Rupert’s Teardrop by Lisa Glass is up and available for pre-order on Amazon. I’ve just ordered my copy. Go and have a look, folks. Thank you, Nik!! My Amazon ranking has just sky-rocketed four hundred and fifty thousand places!!! Honestly!!! I hope that doesn’t mean you’re above me now! :)Best of luck with it Lisa. Can’t wait to have a read. I’ve a feeling it’ll be great!Nik.